What is a seam ? Generally cricket balls like SG ball, Kookaburra ball or any other international standard cricket Ball can be divided into three parts. The two parts which are facing opposite to each other are known as the shiny leather parts. An unattractive layer or disreputable side or line of the ball is formed when the edges of Two leather parts (which are facing opposite to each other) are joined together with the Help of stitches. This unattractive layer or disreputable side or line of the cricket ball is known as “SEAM”. Generally seam of the ball depends upon seamy part of the ball but not on shiny leather part of the ball most of the times. 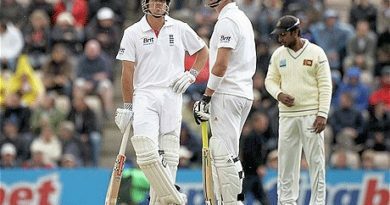 Mostly people often get confused in understanding the concept of difference between the seam bowling and swing bowling. The seam of the ball happens generally when the ball actually moves off the pitch or hits the pitch or after hitting the deck, but doesn’t happen in the air like the swing of the ball happens. The seam of the ball always depends on seamy part of the ball and nature of the pitch unlike the swing of the ball depends on shiny leather part and presence of moisture in the pitch. First and basic concept of the cricket ball in fast bowling or in spin bowling is to seam the Ball or dip the ball into the batsman or away from the batsman.To happen this how do you hold the ball, position of the seam, position of the wrist, nature of the ball and nature of the pitch are important. 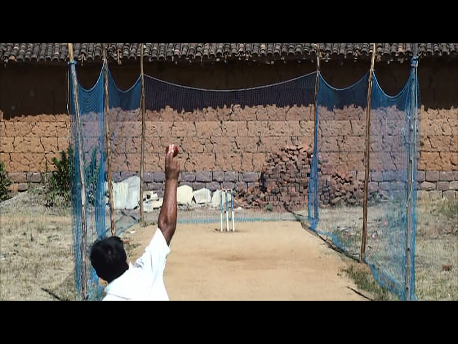 To seam the ball into the batsman or away from the batsman the ball has to pitch on the seam.To pitch the ball on the seam the ball has to be always held with the seam in fast bowling and with across the seam in spin bowling.In fast bowling the ball has to be gripped in such a manner, the fingers index and middle are Slightly separated and rested on left, right parts of the seam completely from tip of the fingers to the other end with the joints, but the fingers shouldn’t be kept flatter on the seam. Then the thumb is nicely rested below down with the seam (pointing towards the batsman) and the remaining fingers are kept down on the right leather part of the ball. After holding the ball with the seam, now to seam or dip the ball into the batsman, the position of seam of the ball has to face towards the batsman or leg slip region with the help or support from the wrist but not with the help of fingers.The fingers has to be straight parallel with the seam and only the position of the wrist has to be adjusted with the fore arm in such a way that the seam of the ball should face towards the batsman or leg slip region along with the fingers. Now the fingers index and middle should play a complete major role in seaming the ball or dragging down or pulling down the seam towards the batsman with the help of wrist. Unlike in swing bowling where only one finger either index or middle plays a major role in swinging the ball. But where as in seam bowling two fingers index and middle plays a major role in seaming the ball. 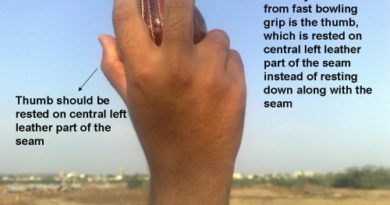 Similarly to seam the ball away from the batsman, the position of seam of the ball has to face towards 1st slip or 2nd slip region with the help of wrist but not with the support of fingers. Similarly the fingers has to be straight parallel with the seam and only the position of the wrist has to be adjusted with the fore arm in such a way that the seam of the ball should face towards 1st slip or 2nd slip along with the fingers. Similarly the fingers index and middle should play a complete major role in seaming the ball or dragging down or pulling down the seam towards the 1st slip or 2nd slip region with the help of wrist. Glenn McGrath, Bret lee, Zaheer khan, Sreesanth, Munaf patel, Makaya Ntini, Andrew nel etc. The above conditions for seam bowling doesn’t mean that you don’t get swing in seam bowling, you will get swing by above conditions too, but to get nice geniune seam positions and to get nice Genuine seam bowling the above conditions are necessary. Generally the seam of the ball depends upon the seamy part of the ball, but not on shiny leather part of the ball most of the times. Depending upon the type of ball and condition of the ball the seaming nature of the ball changes. In India generally we use SG balls which are little bit harder compared to Kookaburra balls. SG balls are more suitable in Indian climatic conditions. To seam the ball the seamy part of the ball has to be harder and grippy. As long as the seamy part is harder and grippy it is easy to seam the ball. This can be seen when the ball is New. But when the ball is old and after completion of number of overs especially in Test matches depending on nature of the ball, the seamy part of the ball gets softer, it becomes difficult for the bowlers to seam the ball into the batsman or away from the batsman. Mind you even if the seaming part of the ball loses or doesn’t lose its hardness it will not stop swinging as long as shine is there. Because swing of the ball will not depend upon seamy part of the ball when the ball is old, odd and starts reversing. Generally SG balls don’t get softer very soon but Kookaburra balls which are used in Australia loses its hardness very soon. The seamy part of the Kookaburra balls gets softer very soon and becomes difficult for bowlers to seam the ball into the batsman or away from the batsman very early. And more over in Australia the pitches are skidding rather than seaming which becomes even more difficult for bowlers to seam the ball. But Australian pitches are true bouncy and rather than seaming. After all the above circumstances at the end of the day it is the nature of the pitch which has to support the seam bowling. The soil of the pitch or the character of the pitch which holds or grips the seaming part of the ball can only support the seam bowling. The pitch shouldn’t be a skiddy, hard, grassy etc Eg : Australian and New Zealand pitches.Australian and New Zealand pitches are mostly skiddy and bouncy rather than seaming. The pitch should be little bit dry and grippy natured. E.g. : England, West Indian and Indian sub-continent pitches. Just like in spin bowling the seamy part of the ball grips the soil of the pitch and tends to move accordingly into the batsman or away from the batsman.